We experienced typical post-frontal conditions today with the last of the passing cold front’s north winds subsiding to calm by 9:30am. This cold front blew hard for a full day and a half, dropping surface temperatures about 4 degrees, from 64F to 60F. 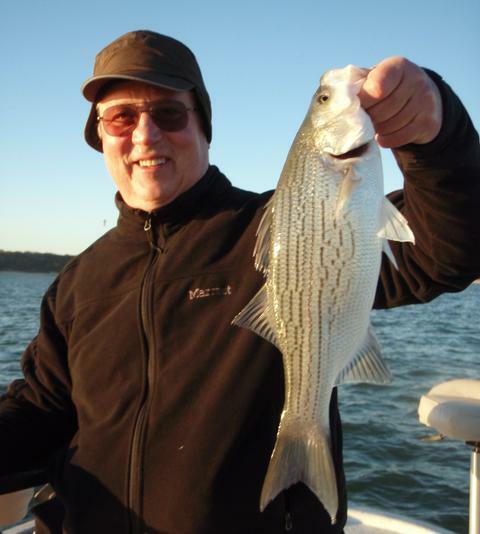 It is usually around this temperature that the “slabbing” bite comes on strong with fish increasingly reluctant to move very far or very fast as the water continues to cool and some winter shad-kill begins. Today I fished Stillhouse and did some exploring in the early morning while we still had some breeze, then hit some high-confidence areas after the winds went slack. During the morning bite, I found good numbers of very aggressively feeding white bass heavily congregated on bottom but willing to respond to an easing technique just toward the the break adjacent to Area 789. I boated 20 fish here and moved while they were still biting so as to find other concentrations of fish while the feeding window was still open and the breeze still blowing. I saw a bit of bird activity, but, unfortunately, it was all centered around diving loons. By around 9:45 or so the wind stopped and things got tough. I headed to Area 945 and idled very slowly with sonar pinging to look very carefully over this area. I did see a small cluster of white bass (which, when such conditions prevail, is all you are likely to see, as the fish blend in with bottom and are not perched above it as they are when feeding aggressively). I stayed, literally within a 15 foot by 15 foot area for two hours and pulled 32 fish from this spot including 27 white bass of which 23 were legal size, as well as 3 largemouth bass and 2 nice channel catfish. Sonar use and interpretation is everything in fishing for these open water pelagics. If you’re reading this and are contemplating a Christmas holiday fishing trip, please don’t delay in getting that on the books. The week between Christmas and New Year is typically booked solid 2-3 weeks in advance. And “yes”, I do have gift certificates available. Air Temp: 31F at trip’s start. Wind: Winds were WNW6 at dawn, tapering to calm by 9:45a. I fished this morning with Charles C. and his two elementary-aged children, Madison and Mason. Charles and his family traveled in from the Houston area to visit his parents and decided to get a little fishing in while the weather is still pleasant. Madison got her licks in first this morning by boating this pre-dawn hybrid from a small school of hybrid holding at 24 feet over a 31 foot bottom. 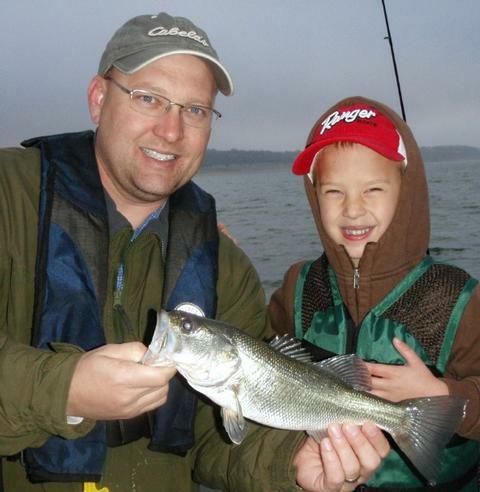 Mason and his dad team up to pose with this largemouth which, uncharacteristically, was caught as it suspended over a clean bottom in open water. Things got off to a slow start this morning due to our extended low-light conditions. We not only had heavy cloud cover above us, but had ground level clouds not quite to the point of mist, as well. We spent our first hour downrigging and boated 2 fish in the vicinity of Area 966. The downriggers at least kept hooks in the water and gave us a shot at the sparse, occasional schools of hybrid we saw around 12-14 feet deep as we waited for light levels to increase and a better feed to kick in. Around 8:15, in the vicinity of Area 297/973 (BA:16RBG, 5T) sonar revealed actively feeding fish over a 31 foot bottom. The fish were in the lower 1/2 of the water column. I e-anchored and we began to work jigging spoons through these fish and immediately elicited a response. Over the next 2 hours we stayed in this general area, taking short hops from concentration of fish to concentration of fish. Typically, we used a smoking technique as soon as we arrived, then, when the fish slowed down, we used a jigging technique. Toward the end of the morning feed (around 10:00a), the fish would not respond to anything but an easing tactic. During the “feeding window”, we boated exactly 52 additional fish including a mix of year classes of white bass with an occasional short hybrid thrown in for good measure. Today’s results were a classic display of the importance light levels play in influencing fish behavior. In the first 1.5 hour of our trip, darkened by clouds and near-fog like conditions, we boated 2 fish. In the last 2.5 hours of our trip, we boated 51 fish, with the first of this action happening as the fog lifted and indirect sunlight bright enough to warrant the use of sunglasses existed for the first time in the morning. On clear days, this level of brightness occurs right at sunrise, thus, the bite typically starts earlier on such days, all else being equal. If you’re reading this and are contemplating a Christmas holiday fishing trip, please don’t delay in getting that on the books. The week between Christmas and New Year is typically booked solid 2-3 weeks in advance. Air Temp: 57F at trip’s start. Wind: Winds were S8 at obscured sunrise and stayed fairly constant for the trip’s duration. Skies: Skies were heavily clouded with no direct sun showing the entire trip. Jordan’s 4.25 pound hybrid tipped the scales as our best fish of the morning. It fell to a White Willow spoon while holding suspended in a small school of fish 15 feet down. As we got started this morning the light breeze had me very concerned. Simply put, Belton does not fish well under calm conditions. As dawn broke, there was at least a ripple on the water and fish began to feed in the upper 1/3 of the water column. Sonar revealed most hybrid were in “wolfpacks” of 4-10 fish each, moving after bait. This makes for a scenario where downriggers excel. We picked up our first two hybrid, both on Pet Spoons, right as the sun began to rise in the vicinity of Area 837 (BA:12RBG). The action was spotty at best with fish popping up here and there and never “hunkering down” in one area very long. 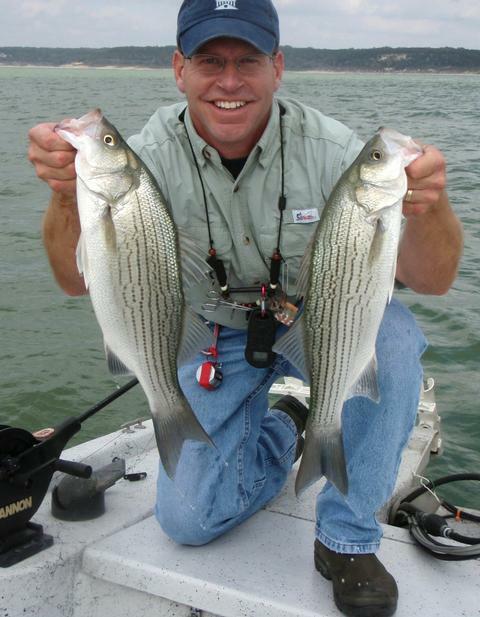 We next headed over to Area 971 (BA:14RBG) and found bottom-hugging white bass with a few short hybrid mixed in. We slabbed over top of these fish with 3/4 oz. TNT 180’s and boated 16 fish in an area perhaps only 30 feet in diameter. This action died after about 25 minutes. We next headed to Area 966/967 (BA:30RBG,6T) and again found wolfpacks of hybrid patrolling in the upper 1/2 of the water column, so, again we downrigged with one Pet Spoon and one White Willow Spoon positioned in the fish. It was at this time that the best action of the day occurred as the wind briefly came up WNW8-9. We boated 14 fish here — all hybrid — including our largest of the day, shown above. This action died as the wind settled, and from this point on the action slowly tapered off to nothing. We managed 3 more hybrid on swimbaits (1 fish) and slabs (2 fish) at Area 972 (BA:8RBG) and then headed back to Area 971 to finish up the day downrigging with the balls set just off bottom for a final 2 hybrid (short) and 1 white bass. It would not be right to close this missive without mentioning the generosity of Luanne’s husband, Mike. He was kind enough to get up at 5:00am to cook eggs for his wife and son’s breakfast and then prepared them a peanut butter and jelly sack lunch. He even sent along a nice gift for me — a “man-wrapped” pair of needle-nosed pliers. That was all very considerate and that kind act did not go unnoticed by his wife. Way to go, Mike!! We need more husbands like that. If you’re reading this and are perhaps contemplating a Christmas holiday fishing trip, please don’t delay in getting that on the books. The week between Christmas and New Year is typically booked solid 2-3 weeks in advance. Air Temp: 46F at trip’s start. Wind: Winds were NW5 at sunrise, tapering off to light and variable by 10:15am. 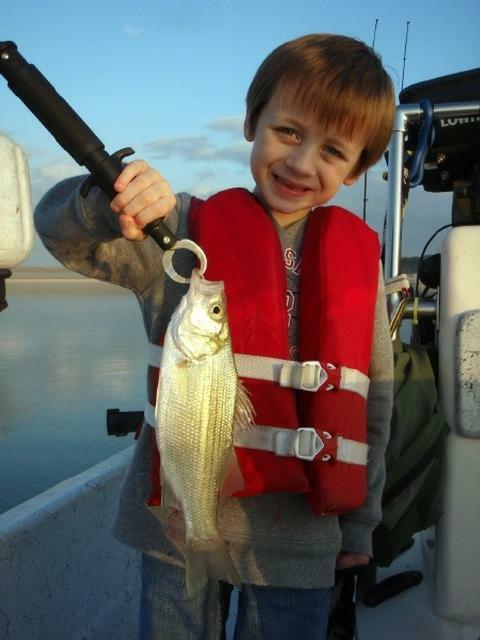 6 year old Jacob Allison and a plump November white bass taken out of 36 feet of water at Stillhouse Hollow Reservoir. 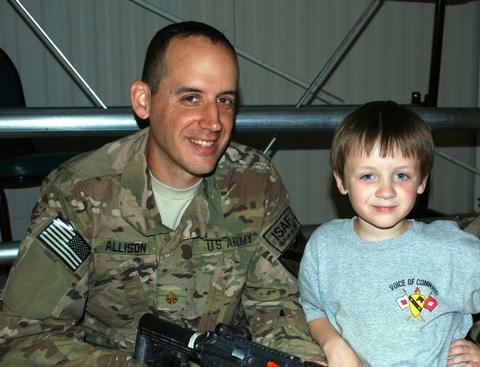 Major Brian Allison and his son, Jacob, on the day Brian left the U.S. for a 1 year tour in Afghanistan in April 2011. At 2:30 this afternoon I found myself standing curbside in a quiet, well-kept subdivision in Harker Heights, TX. I was waiting for the school bus of 6-year old Jacob Allison to arrive so we could start our afternoon fishing adventure. Since I don’t have my own children, this experience was a new one for me … the streets, vacant just moments before, came to life as moms and too-young-for-school-children emerged from everywhere to walk down to the bus stop to meet their precious cargo. Jacob’s mom, Sarah, and his little sister, Kate, were right in the mix. Jacob is the son and oldest child of Major and Mrs. Brian Allison. Brian just completed a company command and now serves as a liaison officer with the 1st Cavalry Division’s headquarters in Kabul, Afghanistan. This is Brian’s 4th deployment of at least a year in length. As Jacob got closer to his house, he looked at his mom with an unsure look. There was a man and a boat parked outside his house. He quickly put two and two together and realized today was the day of the big fishing trip his mom mentioned would happen “pretty soon”. I had already buckled his car seat in place, had his snacks in the truck cab, and got an extra jacket from mom “just in case”. We shook hands and off we went. Although the weather was beautiful, it just wasn’t fishing weather. The grey skies and wind of the morning gave way to fair skies and near calm conditions in the afternoon. 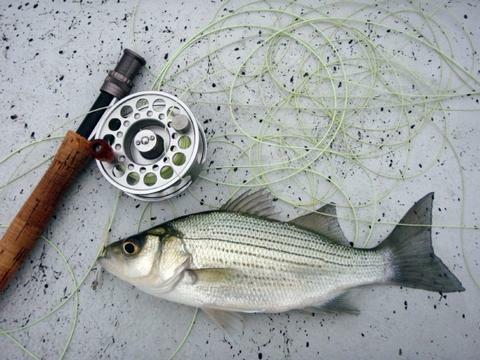 You may have seen me write before: calm winds and white bass don’t mix!! As we headed to the boat ramp, I asked Jacob if he’d ever caught a fish before. He didn’t give me a simple yes or no, rather, he said, “Well, I have a funny fish story.” Hey, this was my kind of kid!! We launched the boat and got on the water. I looked very closely at two underwater features that have been holding good numbers of white bass over the past few weeks. Sonar showed nil on the first area. As we approached the second, sonar showed small schools of white bass (20-40 fish each) clustered together at Areas 927, 945, and 926. Although there were gulls in the area, they were distracted by an insect hatch and were of no use in helping to find fish today. As we got our baits down to where we’d marked fish, I jigged heavily to create commotion and draw fish in and then gave Jacob the green light to jig once the fish came in towards my lure. It truly took teamwork to make things happen today. Jacob’s technique was solid and consistent and as a result, he boated 17 white bass on a very tough afternoon that required a very technical approach that is beyond the reach of most 1st graders. After our trip we headed over to the gas station to top off — really just to extend our “guy time” a little because I knew Jacob was really missing his dad. He’d been home on R&R recently, and it’s always tough to see them step back on a plane and depart for several more months. Following our trip I gave Jacob and Kate a SKIFF bracelet (Kate went immediately to put it in the jewelry box in her closet), and Jacob got his tackle box and camping blanket, as well. Thank you, one and all, for the part you played, large or small, in making this day possible for Jacob. It was a bright spot in the midst of a tough time. Air Temp: 71F at trip’s start. Skies: Skies were fair with grey clouds building in the north near sunset. Having established a reliable pattern of fish behavior on the lower end of Belton Lake over the past two weeks, I went out today in search of other concentrations of fish in the Leon River arm. 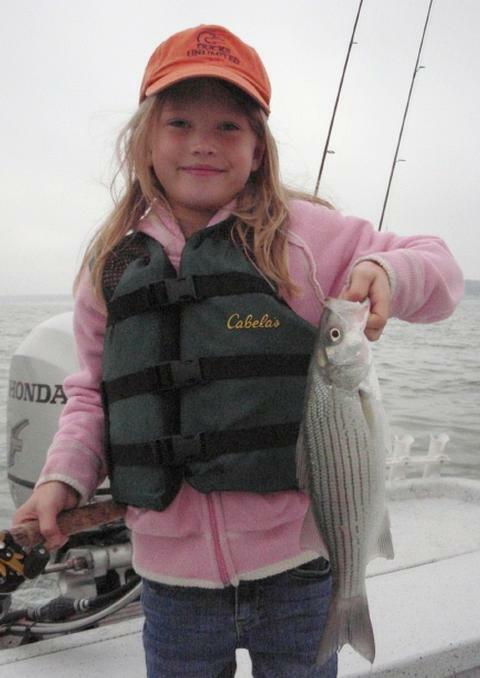 This morning’s low-light conditions fueled by cloud cover and the still-warm water temperatures made conditions just right for flyfishing for shallow white bass and hybrid striped bass. 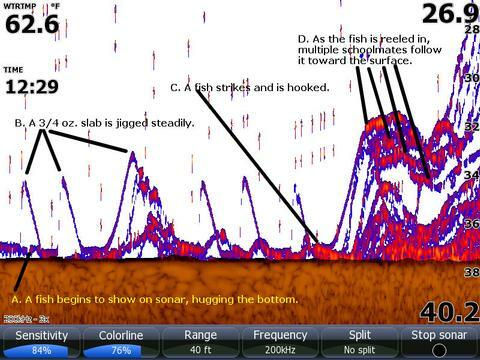 I first looked over Area 725 (BA:15 RBG) and liked what I saw in the way of both active gamefish and quantity of shad showing on sonar. I fished in this general vicinity for about 2 hours boating a total of 37 fish of which roughly 1/3 were hybrid and the balance white bass. A number of times some light surface and near-surface action erupted allowing for some pretty non-technical flycasting to be done. I boated 7 fish (2 hybrid, 5 whites bass) on the fly before the low clouds cleared and pushed the fish down toward bottom. At that time, a bladebait did the trick worked in a lift-drop manner — a blue and white pattern did the best. Once I’d figured out all this area had to offer, I left with the fish still biting there to find other concentrations of fish. 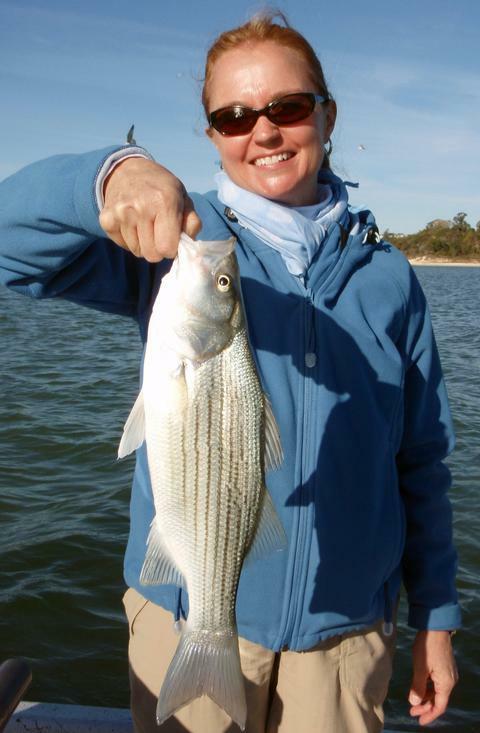 I found loosely schooled, bottom-hugging white bass at Area 968 and boated one on my very first downrigger pass on a Pet Spoon. I’ve fished this area enough in the past to know that once fish are here in the winter, they’ll stay here, so, I moved on looking for yet more fish concentrations. I located one more good group of fish at Area 211. These fish were really glued to bottom and would only respond to a slabbing tactic with an occasional fish perking up to an “easing” tactic. I used both the 3/8 and 3/4 oz. slab and did equally well on both. I boated a total of 35 fish here including a mix of white bass and hybrid (only 1 hybrid from this area was 18+”). Also, remember I do have gift certificates available. Air Temp: 53F at trip’s start. Wind: Winds were NW5 at obscured sunrise, tapering off to light and variable by 10:15am. Skies: Skies were heavily clouded and grey with overcast at ground level not quite turning into a fog for the first 2 hours. I fished this morning with U.S. Army retiree Bill C. of Killeen. Bill has always been a bank fisherman who primarily targeted crappie from the bank or from marinas, so, today was a whole new experience for him. Bill was great company. He loves and serves the Lord, his church, and his community. Yes, he’s retired, but I think he does more now than when he was working between Sunday School teaching, working with church bus ministry, Habitat for Humanity, serving food to the elderly, and more. Just a great guy and a pleasure to fish with! We found active fish spurred on by the still incoming cold front that filtered in overnight and into this morning. As they typically do, the fish fed heavily until the N. wind peaked and began to fall off; at that time the fishing also began to fall off. We found pods of surface or near-surface feeding fish spread all over the crescent-shaped area defined by Area 837 to the S., through Area 859 to the W., and Area 839 to the N.(BA:30RBG,9T,3WP) and fished these fish primarily with slabs and swimbaits worked horizontally in a very simple, no-frills manner. The key was to spot fish on sonar, know what depth they were holding at, and let the lures sink to that depth and try to keep them their by controlling retrieve speed and rod tip location. Once the action throttled back a bit with the brightening sun, we took a more vertical approach targeting bottom-hugging or bottom-cruising fish doing particularly well at Area 966. By the time all was said and done we’d boated 56 fish today, capped off with Bill’s 3.75 pound hybrid taken on a horizontally worked slab. As you’re reading this, please know that our fishery is in great shape. Yes, the water is low due to drought, but that’s about all that is wrong right now. The fish are doing what they normally do this time of year which is feeding heavily during falling water temperatures and responding as they typically do to frontal activity. I fear the newspaper and TV news stories of drought, low water and water hazards has scared folks off a bit — I know boat and fishing the pressure on Belton and Stillhouse has been very low, which only adds to the quality of the fishery! If you’re contemplating a Thanksgiving or Christmas holiday fishing trip, by all means, don’t hesitate!! Wind: Winds were NW12 at sunrise tapering to N3 as the cold front blew out by 10:15. The ORVIS company, known for both flyfishing and wingshooting gear, just had the grand opening for their newest store in the Arboretum area of Austin at 10000 Research Drive. ORVIS made a sizeable donation to the SKIFF (Soldiers’ Kids Involved in Fishing Fun) Program run by the Austin Fly Fishers and me. We’re all very appreciative this effort. This greatly enhances our ability to put more boys and girls on the water this year and next while their moms and dads serve our country in harm’s way. Great people, great store — I hope the fishing community allows for their success in the years to come! 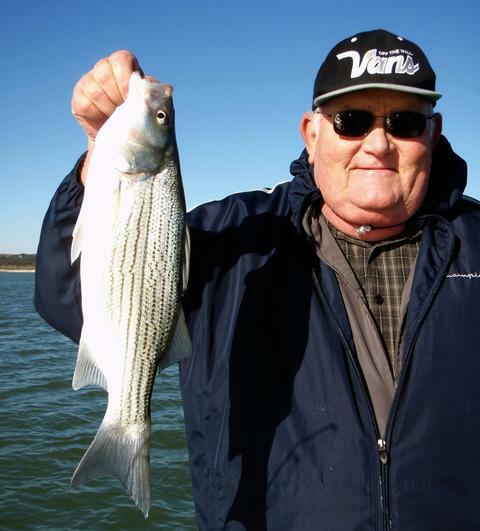 I fished Belton Lake this morning and was specifically out to beat my own current hybrid striped bass record on the flyrod, but the higher than expected winds quickly put an end to that hope. This pair of hybrid came on consecutive casts out of 29 feet of water on a small swimbait imitating the size of shad most fish in this area were feeding on. Fishing this morning was very “straightforward”. The fish fed up high in the water column at first light, allowing me to take 4 hybrid and 5 white bass near the surface on swimbaits just north of Area 836 over ~30 feet of water (BA:8RBG). To make sure I found active fish in multiple locations for forthcoming trips with clients, I moved while this action was still going in search of other active populations of fish in other locations. I found lots of white bass, although most were smallish, at Area 960, boating 13 before moving on while they were still biting. These were all jigged with a TNT 3/4 oz. slab in HTLGS pattern. The morning bite came to a close as I fished Area 187 and vicinity, mainly to the NW (BA:12T,25RBG). This was by far the most productive area holding quantities of fish, quality fish, and lots of bait. I boated 52 fish here mainly by smoking at first, then, as the fish settled, by jigging. Fish came on swimbaits (larger fish, but lots of missed strikes) and on slabs (caught most every fish that struck, but many of those were smaller fish). Wind: Winds were S9 at sunrise, slowly building to S16 trip’s end. Skies: Skies were 80% greyed with high, thin clouds. 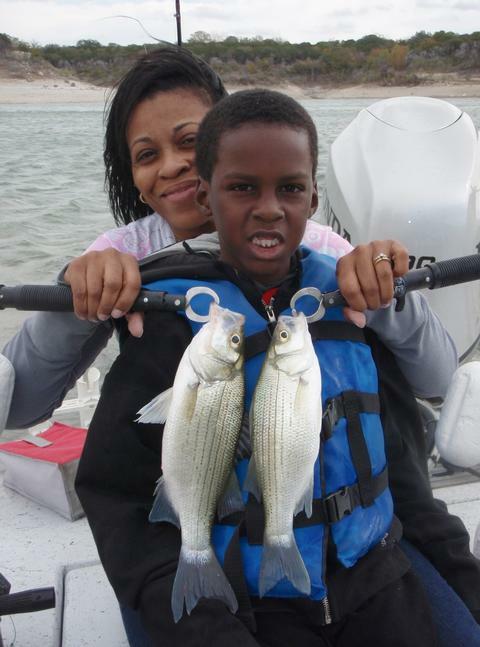 For the second Saturday in a row I had the pleasure of fishing with aspiring young angler Joseph B. of Killeen. Joseph is 7 years old and caught his very first fish during an outing with me last weekend during which we boated 10 fish. Joseph blew his former personal best catch of 10 fish in one trip right out of the water by boating 31 fish on today’s trip! As we got started, we did a bit of downrigging in the vicinity of Areas 909/644 over 21-26 feet of water. We also had a single flatline rod out. We boated a total of 5 fish in this area as I kept an eye on the building wind and looking for any bird activity. As fewer and fewer fish appeared up off bottom, we transitioned to working slabs over deepwater areas ranging from 23-41 feet deep. We put 13 more fish in the boat at Area 961 by 9:15. After these fish cooled off, we went hunting elsewhere with sonar. As we searched out a few areas, Joseph told me he’d taken printed photos of our trip last week in to school for show and tell. I would like to have been a fly on that wall!! Joseph really has taken to fishing very quickly and maintains his enthusiasm longer than most 10-12 year olds I have on board. By around 9:25 or so things got tougher. We were able to find fish and get them to respond initially to our presentations, pulling a few fish in, but then they’d cool off really quickly and either lose interest, move on, or both. We caught 4 fish at Area 949, 3 fish at Area 926, 4 fish at Area 927, and 2 fish at Area 962. It’s interesting to note that this is the time the prime morning feed ended on Belton Lake during yesterday’s trip, as well. By 10:45 the winds were at 18mph, with frequent higher gusts and so I decided to play it safe with my young fishing buddy and head back in to safety. Aunt Marisa was at the ramp waiting for our return where Joseph got to show her a few of the larger white bass we’d caught and pose with her for the photo above. Air Temp: 54F at trip’s start. Wind: Winds were S5 at sunrise, slowly building to S18 with higher gusts by 10:45a. 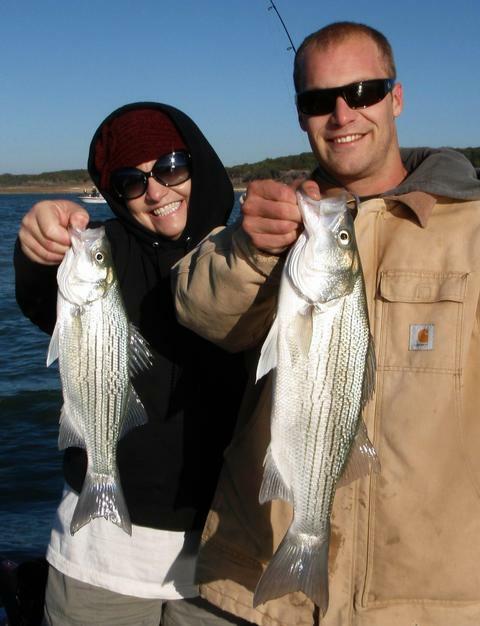 This morning I welcomed Tom and Kimmi D. of Harker Heights aboard and headed out on Belton Lake after a mixed bag of hybrid striped bass and white bass. Kimmi and her long-awaited big hybrid! This fish struck a Swimmin’ Image crankbait rigged behind a downrigger. Tom with his first keeper hybrid of the trip taken just moments after sunrise on a horizontally retrieved TNT180 slab. Kimmi didn’t have prior experience with spinning gear but very quickly got accustomed to using it during our “practice round” near the boat ramp. This “practice round” is useful for getting my guests through any learning curves BEFORE we get on fish. This allows us to maximize our fish catching potential once fish are found having worked out all the kinks ahead of time. This morning we found fish (BA:30HG,10T) primarily within an area triangulated by Areas 836, 683, and 300. The best action came from sunrise to around 9:15, and then slowly tapered down thereafter. During the peak of the action, most fish were up in the upper 1/3 of the water column during which time Tom took fish by casting a slab horizontally and Kimmi took fish working a slab vertically. The fish were scattered over a large area and were moving about quickly, so, we transitioned over to using downriggers set up high in the water column and, one rigged with a Pet Spoons and the other rigged with a Swimmin’ Image, scored more consistently with these than with the slabs. Anyway, when the early bite died around 9:15, we began fishing in the lower 1/3 of the water column by hovering over small groups of fish as we encountered them on sonar. We made 3 short stops all in the vicinity of Area 959 and boated 6 fish in about 25 minutes time. Eventually, even the bottom hugging fish got sparse and we moved on. We moved on to Area 960, searched with sonar, found fish in short order and began putting fish in the boat, but found all were short whites here. We pulled up after boating 6 to look for some better quality fish. Tom and Kimmi are both avid bird watchers, so we counted it fortunate to sight an osprey as we motored toward Area 954. Once we got there, I immediately saw fish on sonar up high in the water column. As we got set up in a hover over this area, Tom had his slab dangling in the water just 18″ under the surface waiting for me to get the boat near-stationary when a white bass got brave enough to attack it at boatside! By around 10:40 it was clear that we’d seen the best of it this morning, and, with an appointment Kimmi had to keep in Waco, we decided to call it a good day right then and there. We ended our day with 42 fish boated. Air Temp: 34F at trip’s start. Wind: Winds S7 at sunrise, going nearly slack by 9:00a, then slowly building to S14 by 11a.